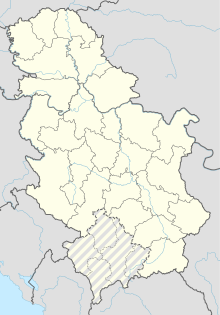 Ponikve Airport (Serbian: Аеродром Поникве / Aerodrom Ponikve) (IATA: UZC, ICAO: LYUE) is an airport in the western part of Serbia, located on the Ponikve plateau: 12 km (7.5 mi) northwest from the city of Užice. The airport boasts one of the longest runways in the Balkans, and the second longest in Serbia. In the vicinity of the airport are some of the popular tourist attractions and ski centres (Zlatibor, Tara, Mokra Gora). Ponikve Airport was built in the period from 1979 to 1983 but until 1992 it hasn’t been actively used. In 1996 and 1997 Jat Airways, then known as JAT Yugoslav Airlines, served the airport twice a week for a domestic round line Užice - Belgrade - Tivat - Užice, with an ATR 72 turboprop airliner. Operations ceased in 1998 as the number of passengers reduced greatly. Ponikve airport was heavily bombarded by NATO forces during the 1999 NATO bombing of Yugoslavia. On 21 October 2013 the Ponikve Airport greeted the first international civil flight - on the runway landed Cessna Citation CJ3 with two crew members and five-member delegation of businessmens from Brussels. Same day in afternoon hours Business jet went to the Thessaloniki. Since 2006, the process of reconstruction of the Ponikve Airport has begun. The runway reconstruction has been completed and as of 2016, it has 3,200 metres (10,500 ft) in length (around 2,200 metres (7,200 ft) reconstructed). Also, the new terminal building was built in 2016. As of 2018, together with Kraljevo-based Morava Airport, Ponikve Airport has the potential to become minor international airport if further efforts are being made. In January 2018, the Government of Serbia granted a 25-year concession of the Serbian largest Belgrade Nikola Tesla Airport to the French airport operator Vinci Airports for a sum of 501 million euros. As part of the deal, other three Serbian civil airports (Niš Constantine the Great Airport, Morava Airport and Ponikve Airport) are restricted when it comes to annual passenger flow expansion; they are allowed to increase to a maximum of 1 million passengers over the next 12 years. There are no scheduled services to and from Ponikve Airport. ^ Pejović, B. (3 May 2016). "Nova aerodromska zgrada od kaponira na Ponikvama". politika.rs (in Serbian). Retrieved 4 December 2017. ^ "Direktor Aerodroma Ponikve: Nastavljamo sa ograđivanjem prostora oko piste; U planu i uspostavljanje redovnog avio-saobraćaja". politika.rs (in Serbian). 19 February 2019. Retrieved 20 February 2019. ^ Božović, Nenad (3 December 2017). "PRIŠTINA NAM UZIMA PUTNIKE Srbija bi mogla da osposobi još DVA AERODROMA za civilne letove". blic.rs (in Serbian). Retrieved 4 December 2017. ^ "Pala odluka: Kome će "Nikola Tesla"". b92.net (in Serbian). Tanjug. 5 January 2018. Retrieved 26 January 2018. ^ Miladinović, Z. (17 January 2018). "Najava novog "gušenja"". danas.rs (in Serbian). Retrieved 26 January 2018. This page was last edited on 25 February 2019, at 17:35 (UTC).